British Columbia has over 4000 miles of Pacific coastal shores and this does not include the circumferences of it's many coastal islands. From April through September, the waters off these shores are the aquatic highways for five Pacific salmon. But, one, a salmon I prefer to call the Prince of the salmon, pauses along these aqua routes near kelp beds, shoals and small islands. This Prince is the sportsman's fish, the angler's trophy, the west coast fly fisher's apex. This is the salmon that provides that crescendo, that climax to long hours of casting and hunting. And, what a saltwater salmon he is! This is the fighting fish that dances on water, that arcs in startling six foot leaps, that strips reels to their backing then beyond, and, even when finally brought to the boat, this salmon twists, turns, and tugs in a manner that makes even the most experienced fly fisher pant and praise this Prince of the north Pacific. This past summer was my journey into various locations along our B.C. coast. It was a summer of success and silver smiles. It was also a summer of folly and frustration. Water colors were the most serious problem, the frustration when previous patterns refused to attract the Prince. But, experimentation provided a whole new set of patterns that eventually gave me that vital confidence in this exciting saltwater fishery. Situated in the center of the B.C. coast is Hakai Pass. 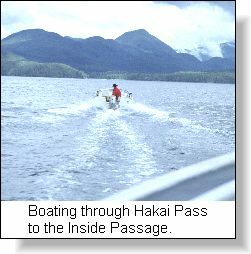 This 'wide passage', as this Indian name means, provides an east-west break in the islands and mountains that forms the long north-south Inside Passage. It has been declared as a Marine Recreational Park by the provincial government, a status that retains the remote wilderness appeal of this special area. For many salmon it is their first landfall after travelling the north Pacific currents in the Gulf of Alaska, and provides that special pass which allows them to enter the Inside Passage and head for their natal streams. But, it also acts as a route for many south heading salmon including those along the east coast of Vancouver Island, the Fraser river and even the Columbia river. Throughout the summer months of July & August it is rich in homing migrating salmon, a place made for the salmon fly fisher. 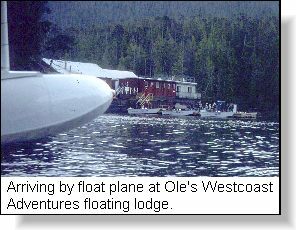 This past August I accepted an invitation from Ole's Westcoast Adventures to stay at their floating lodge in Hakai Pass. I was there to experiment with salmon fly fishing and I was not disappointed. Flying out from Port Hardy on the northeast coast of Vancouver Island, I was astounded at the vast number of small islands punctuating Hakai Pass. 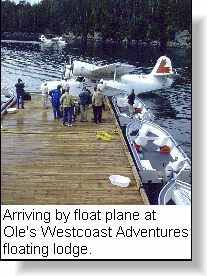 The 45 minute flight by Pacific Coastal Airlines to Ole's Lodge provided an exciting overview of this very fishy region. It was a trip for experimenting, a chance to try my many successful southern salmon fly patterns that had landed so many silver coho in the waters around Vancouver Island. The traditional method of salmon fishing in Hakai Pass has been with trolled cut herring in the prime fishing locations of Barney, Odlum, Bayley, Kelpie, the Racetrack, and the Gap. The kelp bed at Bayley was my first target after a day of orientation by Fishmaster and General Manager, Ernie Daley. The Bayley fishing waters are a traditional early morning coho location located at the northeast corner of Hakai Pass. Concentrations of boats from the many resorts in Hakai Pass provided a view of constant salmon action. It is an area that simply cries for salmon fly fishers. On this trip I anchored at the west end of the kelp bed and used the ebbing tide to hold me steady in the ever present saltwater current. "Black Bombers" were everywhere! 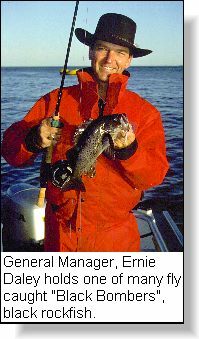 In fact, back at the floating resort one angler asked me if there was ever a time I did not have one of these sporty black rockfish on the end of my fly line. It seemed, he said, that every time they looked over to my boat I was playing another fish. The black rockfish were so suicidal in this location that I was unable to work my casts for the salmon that were cruising in the same currents. At Odlum, it was different! I was still experimenting with various silver, chartreuse, and pink patterns tied with Mustad 34011 stainless steel hooks searching for that attractor pattern that would entice the Prince. On this third day of my trip I had the camp cook, Lars, with me as guide and guest. Lars was keen to try fly fishing in saltwater and he knew some additional locations where the salmon were in shallower waters. At Odlum Point he showed me a series of underwater benches with kelp beds, perfect locations where we could tie our bow rope. As at Bayley, the Black Bombers were exciting and we managed to hook and release at least a boat full during the afternoon. But, out from the kelp bed there were also salmon! Two grilse took a pink variation of the Silver Thorn pattern and this gave me the confidence to work this particular pattern out beyond the reach of the black rockfish. The eventual strike of a heavy salmon came just as I was getting my cast - retrieve routine into a methodic process. The strike was a smash hit and I can still see the fly line I had retrieved bounce off the floor and streak through the rod guides. I was also experimenting with a new reel, a Scientific Angler's 'Mastery Series' #8/9, which, while light weight, held an impressive spool of 300+ yards of backing. It was needed! I had hooked a large flashy Northern coho of fifteen pounds and he was into the backing in nanoseconds. I had set the reel at the point of least tension, a tip I had learned after loosing big fish in the past. The untried reel was my biggest concern but it spooled the line out in smooth turns with no fatal jerks. Well into the backing the Prince started it's flashy surface display but to no avail. A long retrieve, after many surface and deep water dogged fights eventually brought the trophy to the boat. A Hakai Pass hook nosed Northern coho, the Prince of salmon, on the fly - what an experience! On the final day Fishmaster Ernie Daley, an accomplished fly fisher joined me for a short fly fishing jaunt. During our short trip we once again found the schools of large Black Bombers and thoroughly enjoyed the fighting thrill of these sporting fish. 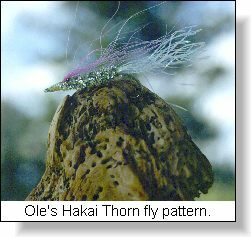 The fly we used became designated, "Ole's Hakai Thorn", the monicker for one more successful Pacific salmon saltwater fly pattern. Ole's Hakai Pass West Coast Adventures floating fishing resort is in its 14th successful year of operation and is situated in an ideal location in Hakai Pass. It offers all-inclusive fishing packages in private accommodations. Outstanding gourmet meals, complimentary bar, fishing licences, total fishing catch care, boats, gas, tackle and foul weather gear are also provided in your package. Contact Ernie Daley, General Manager, by phone or email for further information on a saltwater fishing package of a lifetime with trips geared for either the novice or the experienced angler.